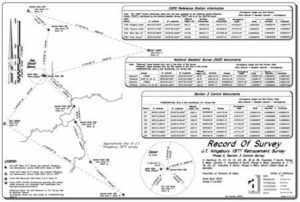 Land Surveying | Record of Survey | Adobe Associates, Inc.
A Record of Survey is an official map (18 x 26) that is reviewed by the County Surveyors Office and then recorded with the County Recorder’s Office. This map represents a survey made on the ground and delineates the deed described lines. This map can also represent the location of any easements that affect the subject property, although the easements are not required to be shown. If there is a need for a Land Surveyor to locate easements a title report of the property should be provided by the client. There are instances when an easement that is described may not be able to be located on the ground due to the poor description. At the end of this process most Records of Surveys will reflect setting monuments at your property corners. The filed map with the County will delineate bearings and distances around the perimeter boundary, this is necessary so the property lines can be readily retraced in the future, and the monuments are physical points in the ground so one can see their corners on the ground. There are numerous reasons to necessitate the need by a licensed Land Surveyor, such as for fencing purposes, possible encroachments by adjoining neighbors, development of your property, building along setback lines, definitive acreage of your parcel…etc. The Business and Professions Code under section 8762 of The Professional Land Surveyors Act, REQUIRES a Land Surveyor to file a Record of Survey when he/she establishes or reestablishes a boundary line that is not of record. 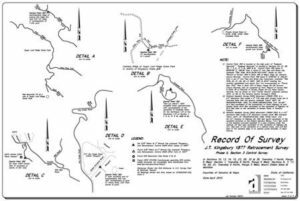 Of record in this case means that the lines you have established or reestablished must be shown on a Record of Survey, Parcel Map, Final Map, or tract Map that is already recorded with the County. If these lines appear, Surveyor needs to establish and reset one of the corners with a monument, then there would be a requirement to file a Corner Record with the County Surveyors Office. A Corner Record is an 8.5 x 11 plat that reflects the position of an already existing comer, from a previously recorded map, that is missing and the Surveyor is replacing the monument based upon other existing monuments found and their calculated positions based upon the record information as shown on the previously recorded map. Anytime a Land Surveyor is asked to show any information such as, topographic site features, easements, or proposed development, in relationship to a boundary line, then he/she will be required to file a Record of Survey, unless the lines are shown on a recorded map already. A Surveyor can also be required to file this map if requested to set permanent monuments around an easement. Anytime you set a monument in the ground, you must either file a Record of Survey, Final Map, Parcel Map or Corner Record, there is no other possibility. The basic steps involved from start to finish with such a document is first to prepare a contract or addendum with the client that outlines the scope and payment process. After the contract is in place the Surveyor must research not only the subject properties deed, but all the adjoining deeds to see if there are any conflicts or possible conflicts within the deed described lines of the boundary, Once the research and preliminary calculations are done the Land Surveyor in charge will either be a part of the field crew or outline a field crew on which pieces of evidence should be located on the ground to allow for the Land Surveyor to assess the field evidence and make a determination of his/her opinion of the boundary lines. There are times when the field measurements of the evidence and the deeds do not match, and it is at this point when the Land Surveyor must make boundary decisions based upon Professional Land Surveying Practices. When these conflicts exist it is common that more than one trip is needed to collect additional field evidence for the Land Surveyor in charge. At the time the field survey is performed on the ground the survey crew should make measurements to any potential encroachments such as buildings, roads/driveways, fences,..etc., and with any potential conflicts they should show on the map that is going to be recorded. After the final boundary resolution by the Surveyor the field crew should make one more trip to the site to set the property corners. Sometimes the actual corners cannot be set because the corner falls in an inconvenient place such as a rock, in a creek, on a utility box. ..etc., and in these cases, a monument should be set on the line at a distance from the corner, this distance will be reflected on the recorded map. As one can see there is a tremendous amount of work involved in locating boundary lines. A Land Surveyor does not make decisions on ownership within those boundaries, only a court of law can do such a task. A Land Surveyor licensed within this state can only give their Professional Opinion on the location of the deed described lines, not the physical ownership within these boundaries. As discussed earlier when one locates encroachments and documents them on the map, we are simply stating a mere fact that, the fixture located has a certain relationship to its deed described lines. To find out more about possible Adverse Possession, or Prescriptive Rights, please seek the advice of a Land Use Attorney. The cost of a boundary survey is not necessarily dependent on the size but more importantly the accuracy or completeness of the legal description describing the property, although size and terrain definitely play a role in the budget. A 1/2-acre parcel could cost just as much as a 10-acre parcel depending on the surveying previously done in the area, availability of existing monuments and the accuracy of these monuments, and how well the property description was described. Properties are described in three basic types of descriptions for real property conveyances. The first is what we refer to as an Aliquot description which is a description of a part such as the northeast quarter of the northeast quarter of Section 10. These descriptions are common in sectionalized Lands that were first performed at the turn of the century or earlier. Another type of description is referred to as a Lot and Block description which is commonly used for Lots within a Subdivision Tract. 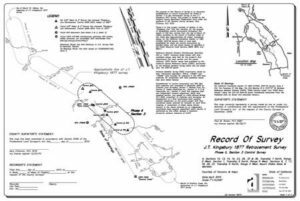 An example of this type of description is: Lot 5 of Block 2 of Sonoma County Subdivision, as filed for record in book 10 of Maps, page 5. Generally these types of descriptions have monuments that should be readily available, unless the recorded Subdivision Map was recorded prior to 1940. This isn’t to say that maps prior to 1940 don’t have monuments; it just means that documenting subdivisions became more prevalent as time went on. Most jurisdictions require every lot corner and angle point be set and shown on the maps being recorded these days. The last type of description for conveying real property is what is referred to as Metes and Bounds descriptions. Metes means the bearings and distances used in the description and bounds being the monuments referred to in the description, monuments are both physical, such as iron pipes, fences, trees, boulders, and then there are record monuments such as qualifying your description to a record line such as to the north line of Adams. One must first establish the north line of Adams before you can locate your line. It is these surveys that can be expensive because most of your errors in descriptions come from the Metes and Bounds type descriptions. Land Surveying is both an art and a science. The science behind the practice of Land Surveying is the ability to perform calculations and make accurate measurements. 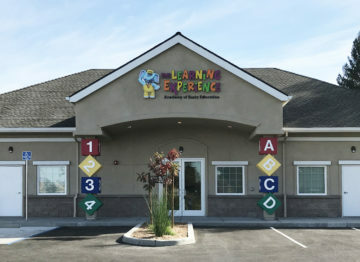 The art behind the practice is the skill and knowledge on how to depict problems within a survey but then how to also resolve these matters as best for the benefit of your client and for the protection and welfare of the public. We here at Adobe Associates, Inc., hope that this short informative description of what a Record of Survey is and the requirements that Licensed Land Surveyors are obligated to, is helpful to you in understanding the cost involved. We also hope that you can see the value in having such a survey performed by a qualified person and then recorded with the County Recorder’s Office. This map will be filed for record for the rest of time, which is a great benefit for not only you, but for everyone to come after you. If you have any questions regarding specifics with your property, I encourage you to contact any of our Principal Land Surveyors within our firm.